Sitting at a social gathering. One prominent PTI supporter here in Dubai was overheard saying that why the Federal government is wholly responsible for the anarchy in KPK and how being a federal subject they (PTI) do not have much control? When some one asked that in case the government is inept on the negotiation front. Than why not PTI and Imran Khan take the lead and bring this to the point where no side can turn back and show leadership by action for a change instead of word mongering. There was silence on the other side. But then again isn’t that the case every time with a PTI supporter when confronted by logic . Only difference is that this time I feel genuinely PTI , its leadership and its supporters are in a dilemma as they are soon realizing that they cannot have their feet in both boats at the same time. From “Its not our war” to “Its America’s war” . From “Taliban are friends” to “Some Taliban are enemies” PTI and especially its leader has been seen changing party lines over the course of the issue. Asad Umer was heard saying in one program on TV that Imran Khan has become more categorical in denouncing Taliban. I may agree with him as interestingly Imran has denounced Taliban by 0.00001% more than before the elections which is again a big achievement for him. PTI in my opinion is in a split right now. I am sure out of the 7.6 Million votes they got in the National Assembly Elections and with approx 4.0 Million of which coming from KPK. People who wanted to vote against the last corrupt government voted mainly for Imran, also I feel that since APML could not get properly launched some vote went from there as well. At the same time lets not forget KPK where Imran and PTI made major gains which saw MMA winning in the 2002 elections. Meaning simply that there is radical vote existing in the country approximately in tune of 3-4 Million which instead went to PTI across the country inclusive of Karachi this time round mainly. Now the non radical PTI voters who chose to vote for PTI in the name of change are finding themselves in a difficult situation because where; as there party is seen pro TTP and extremist parties . The confusion runs amok as I am sure that soon they would find it difficult to associate themselves with the party they voted after much fanfare. Confusion is that when Imran Khan denounces Lashkar e Jhangvi in Baluchistan for attacking Hazara Shia Community but choose to ignore the Taliban who have attacked schools, hospitals, bazaars, police and army in his own province dozens of time. Confusion I am sure for the party supporters is that Arif Alvi join rallies with LeJ and JI in Karachi responsible for attacking Shia community and at the same time try to join Majlis e Wahdat e Muslimeen rallies in Karachi . Confusion is that when Jamaat e Islami’s Amir call our soldiers non martyrs and Taliban as martyr their leader (Imran Khan) take a quiet line on the same and yet choose to continue in alliance with the same party which has impacted the morale of our jawans . More confusion prevails for the same PTI when Imran Khan who gave us headaches during elections about claiming to bring back the looted US$ 60.0 Mn by Asif Zardari to poor people of Pakistan and is fine to go in an alliance with PPP for the Local Bodies Elections as per sources in Karachi . The Dharna against the Bilawal House wall was just a drama as Arif Alvi was being pressurized to let some UC/Councilor seats go to PPP as seat adjustment in Clifton-Defence and was left on his own by the party as per sources of their own party. Seeing his imaginary vote bank dilute and knowing that PPP also voted for him in the NA elections; created all the rumpus to create leverage and once again make a fool out of the people. The wall stays and you would see the alliance would come out soon. Now PTI who was in an understanding with Taliban or TTP before elections . Reason for which their campaigns did not get effected by any suicide bombers across Pakistan where as their opponents in KPK ; ANP was cut to pieces and in Karachi MQM is being targeted by the PTI’s B team. Now I wonder how come they would be able to back out on the promises made to them that 1) under their government the Nato supplies would be stopped, 2) there would be no Drones, no Military Action and 3) they would be brought in the main politics. The above paragraph would bring definitely a lot of ire on me . But it was Imran Khan who suggested opening Taliban offices all over Pakistan . It was him and his party who frowned and protested over drone strikes but never for the victims of the Taliban and their hell forsaken Suicide Bombers. It was him who denounced attack on Hakeemullah Mehsud but only said was sorry to know and that too after a few days for the Shaheed General Niazi. It was PTI who chose not to visit Aitezaz Hussain’s home and it was PTI and Imran Khan who is standing between the Taliban and the operation. Now PMLN also do not want to go into operation unless all parties agrees. Fearing repercussions in case the operation take a twist and knowing that they cannot control the Army machine in Pakistan . But at the same time I wonder why would PTI want peace in KPK and the rest of the Pakistan as this is the main leverage PTI and especially Imran Khan holds this key trump card in his hands to keep his political gimmickry going. Secondly, why would people vote for him if Taliban come in the main stream politics. And lastly I am sure if he knows that if he now denounce them . He would invite double wrath of Taliban upon him for breaking commitment as well as using them as a chip to come into power. He knows for sure if he loose this leverage . He loose all and even why in the world would United States route any much needed aid through him in KPK. I am sure the only reason why Imran Khan is so confused is knowing that his position for Taliban is pushing Pakistan only towards more turmoil as negotiation is a farce as even his allies like Maulana Tahir ul Qadri and Sheikh Rasheed Ahmed seem to have ditched him on this issue. But at the same time. You do not see much support or concurrence coming from senior party leaders like Jehangir Tareen, Shah Mehmood or Makhdoom Javed Hashmi . All of whom know very well that not only by taking Imran’s position they just invite more attacks, give more time to TTP for preparing before the Spring Offensive but also making casualty count just grow higher and higher. I am sure they all know that this position is nothing short of being a traitor to the country and its people. Its already in contravention to the constitution of Pakistan which do not allow private armies in the country and that too waging war against the state. I wonder how come this disregard for the constitution is fair and does not come under Article 6. With some of the God Fathers of Imran Khan in the establishment gone or chosen to side with PM Nawaz Sharif ; the former also having the same roots as Imran and coming from Lahore . Imran and PTI are in a quandary in what to do as they say it’s a difficult position between a rock and a hard place. If they side with Taliban due to their arrangements. They would be traitors to the nation. If they side against them. They would be taken to task in KPK and would end up loosing their vote bank and maybe their lives. It looks like the segment which PTI wanted to control to keep in power is the same segment which might bring it down. Whereas the moderate and more literate supporters are realizing what their vote has done is that it has just created representation for Taliban in the National Assembly. The moderate NA 250; the most modern district or constituency of Pakistan must be grinding their teeth seeing their elected MNA standing hand and glove in the rallies with religious extremist parties and not doing much in solving their genuine issues in their areas. Like they say all good things don’t last for ever . Similarly all such positions taken on the basis of wrong commitments are going to end soon as well. Imran Khan and PTI should move away from the middle and level ground for PMLN government to authorize full fledge operation against Taliban across the country as other main parties like PPP, MQM and ANP are game for it. Our army which is one of the best in the world if given mandate and confidence has the goods to deliver the job. After all they did it in Swat. 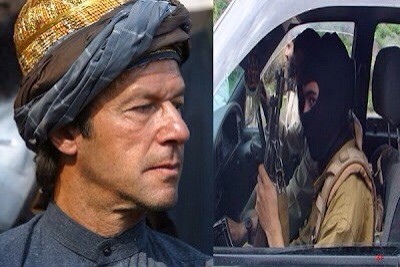 Imran Khan would have to rise from his illusions as both the religion and the politics demand that strong retribution is delivered on Taliban and after that only if they realize their mistakes and agree on rehabilitation then only talks should ensue without stoppage of any fight against them. I would hope that similar position is taken in Karachi against Taliban as well. So that the same situation do not arise where Army builds pressure in one are only to see Taliban dispersing into Karachi or other parts of Pakistan for R&R . We saw that this was the main reason why the operation did not delivered till the end. As the time run out. Imran Khan’s dilemma would keep on increasing and his options would run out and if by any chance his supporters or his imported party leaders start ditching him. Than it would be Game Over for the Khan . I feel he has unnecessarily embroiled himself in this situation as he loose credibility by the minute. He could have used his energy and talent for defending the victims and poor Pakistanis instead. Anyways lets hope sense prevails and he choose wisely. Pakistan Zindabad! Next Post Next post: What is Owen Bennett-Jones interest in Pakistan?